Neutral, earthy shades of brown doesn’t mean boring, this time it’s exclusive and classy! 'Miss Romanova' achieves very elegant look by mixing different shades of it. She adds a bit of black to sharpen the look up. All these clothes and accessories you can wear year after year without looking dated - the fact is that good quality items actually almost look better after some time. It’s good to invest in classic, timeless pieces; they are real wardrobe staples! This look is finished best with some brown eye shadow and neutral, yet polished lips and nails. It will take you through the day at office into a lovely candle light dinner at a cozy restaurant. 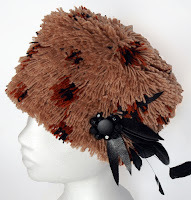 'Smart Miss Romanova' hat is available in Heli MG store now. To get your hands on it, please click here. oh wow - those shoes!! Your hat with these clothes looks very Bond Girl.